The Maharashtra National Law University (MNLU), Aurangabad is all set to offer Bachelor of Laws with Honours from the academic year 2017-18, making the long standing proposal a reality. While NLUs at both Nagpur and Mumbai have already become functional, the Aurangabad one was allegedly kept on the back burner by the government. The Building and Construction department has allotted a budget of around Rs 1.5 crore for carrying out repair and maintenance of the portion in Government Education College where NLU will be set up temporarily. Common Law Aptitude Test, aka CLAT came into existence to cater the very need of the aspirants to give a level playing field. Every year the purview of CLAT is widening. The scope and the seat of CLAT is on a consistent increment. 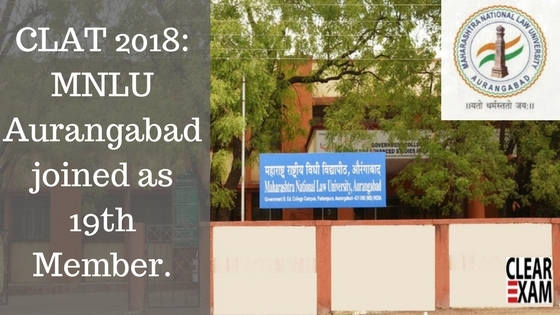 Adding one other institute in its list, MNLU Aurangabad became the 19th member of NLU. MNLU Aurangabad has joined the elite club of NLU. Now, the seats under NLU will be increased and the candidate will have one more choice of college. MNLU Aurangabad offers 60 seats for Bachelor of Laws (Hons.) degree. Admission is through Common Law Admission Test (CLAT). MNLU Aurangabad is UGC recognised and so follows the guidelines and recommendations of UGC, and its curriculum is designed keeping in mind the ethos of social development, and integration of humanities with law. Most faulty comprises of lawyers, and guest faculty includes judges from high courts, and faculty from other national law schools. The college holds conferences such as how to bring about justice with accountability. Competitions such as inviting research papers on burning legal topics, and topics which are cornerstones of legal system also takes place regularly. Extracurricular are also encouraged. There are dance events, standup comedy events and the college also hones these skills of the students. The college believes in giving back to the society, and making its students conscientious citizens. To this effect the college organizes events that better the environment such as tree plantation drives. Another provision that the college makes is for specially abled persons. If the college deems fit then it can make horizontal reservation of 3% for these candidates. Creamy layer principle applies to all above categories except SC, and ST so that the real needy SC and ST candidates get the benefit of the reservation. This provision ensures that the economically poor and backward scheduled castes and tribes get the benefit of reserved seats. The total fee of MNLU Aurangabad is Rs, 2 lakh approximately for all others who do not come from Maharashtra, and for Maharashtra residents the fee is around 22k lesser. There is a feeling in the legal community that this college will go ahead and become one college par excellence. The students here are a diverse mix ,and one sees a pretty picture of unity in diversity. Definitely a college with right values, and its ethos in place. Read here the latest CLAT news updates on MNLU Aurangabad.